Over the last decade, quantitative compositional mapping has emerged as a powerful technique to aid petrological interpretations. Chemical maps of major, minor and trace elements can both depict the spatial distribution of each mineral phase and capture their compositional variability at the micro-scale. However, computer tools are required to calibrate the maps and to produce numerical datasets that enable quantitative investigation of specific petrological processes. The software solution XMapTools is at the cutting edge of progress in this sector, and aims to simplify the data processing by providing statistical toolboxes and functions embedded in a user-friendly graphical user interface. This two-days workshop is chiefly designed as an XMapTools beginner course, where participants will be introduced to the software and learn how to use it routinely. 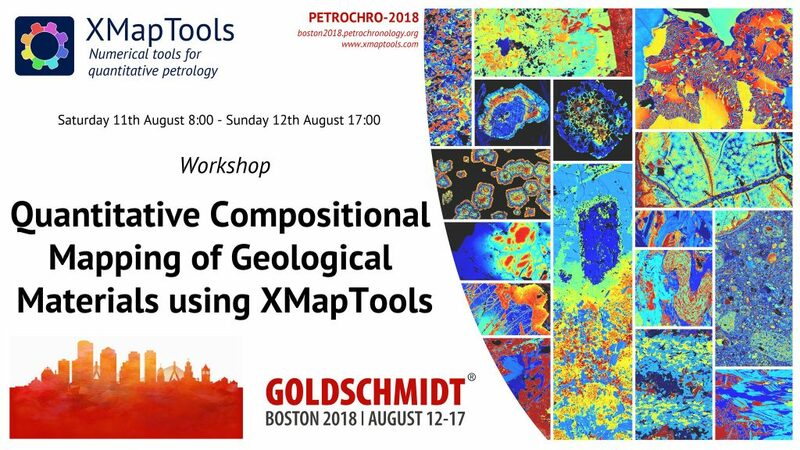 It will involve a series of lectures and practicals from XMapTools developers and experts that explore a variety of applications of quantified map data, including integrated computation of P-T estimates, identification of mineral growth and dissolution events, and assessment of geochemical mobility during fluid-rock interaction. The participants will have the opportunity to learn how to calibrate and analyze compositional maps acquired by both EPMA and LA-ICP-MS. This course will provide an important foundation accessible to high-level undergraduate students, graduate students, and professional researchers who are using or planning to use quantitative compositional maps in their own studies. Pierre is an Assistant Professor at the University of Bern (Switzerland). His research is focused on developing computer tools to investigate petrochronological processes in a large variety of metamorphic rocks. Pierre developed XMapTools during his PhD in Grenoble (France) and he is continuously improving the program since that time. Tom is an Associate Professor at the University of South Australia, who is interested in understanding fluid-rock interactions from shear zones to large-scale geodynamics. Tom is working on quantitative LA-ICP-MS trace element mapping and recently developed an extension of XMapTools to visualize and interpret compositional zoning patterns. Laura is Postdoctoral Fellow at the University of Paris 6. During her PhD, she combined quantitative compositional mapping with other petrological techniques to investigate the processes of re-equilibration in metamorphic rocks. Mahyra is researcher at the Geological Survey of Brazil. Her research is focused on petrochronology; she applied quantitative compositional mapping in combinaison with in situ geochronology to unravel the metamorphic history of various rock types in the Southern Brasília orogen.